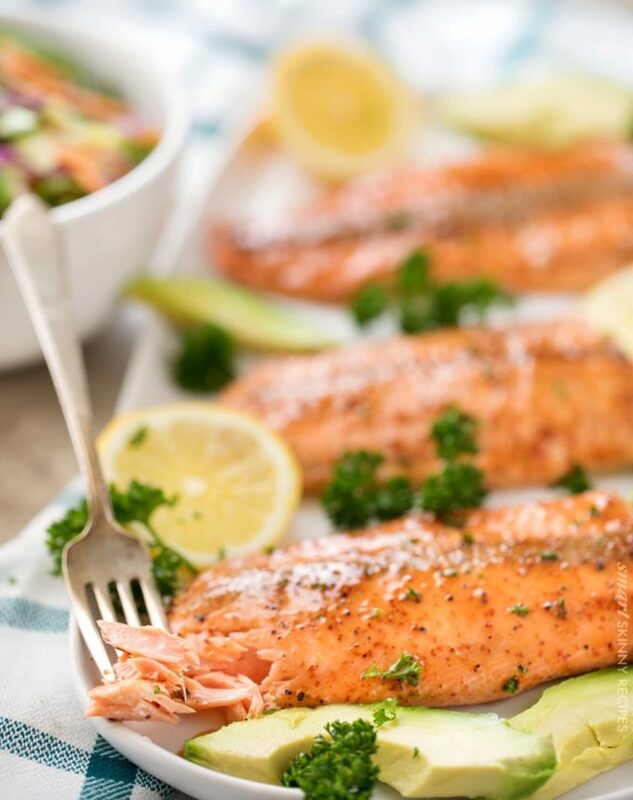 Succulent and juicy salmon filets are brushed with a simple honey dijon sauce, then broiled to tender, healthy perfection! 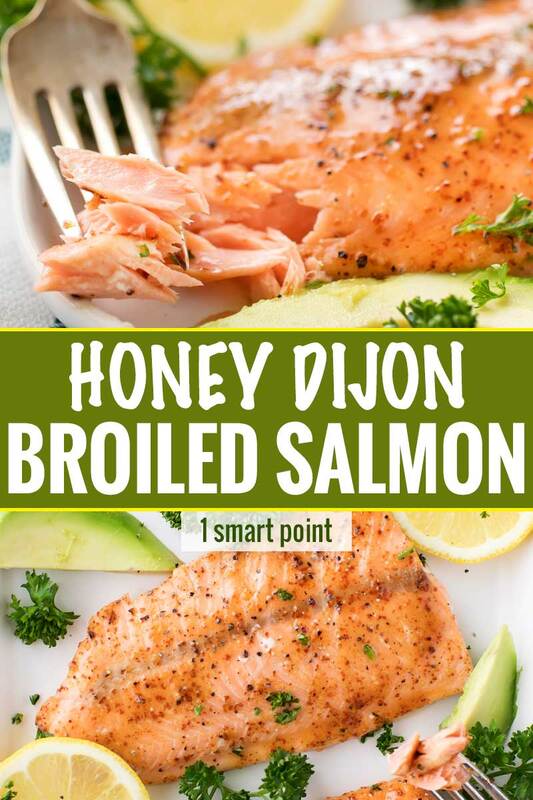 You’ll love how easy this honey dijon broiled salmon is to make… just 10 minutes from start to finish! Salmon has always been one of those ingredients I was intimidated to cook at home. I guess I thought it would be super complicated, or difficult to get to the right texture. But in fact, it’s incredibly easy!! 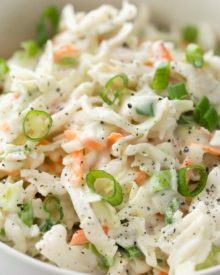 This recipe is one I found in a Weight Watchers magazine, which I then adapted a little based on what I had on hand. Unfortunately, on the day I was going to make and shoot this salmon for these photos, the salmon wasn’t all that fabulous at my local grocery store. Definitely one of the downsides of living in the Midwest! So I had to settle for some thinner, frozen salmon filets. Either way, it still turned out delicious! Don’t let the broiler intimidate you… it’s basically just an upside down grill! 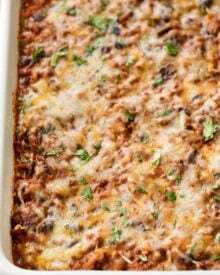 Line a baking sheet with foil or parchment paper, preheat broiler to high and adjust the oven rack so food will be 6 inches from the heat. Broil the salmon for 5-10 minutes, depending on the thickness. Done! Super easy! It all depends on the thickness of the salmon, but a good general rule of thumb is 9-10 minutes per inch of height. 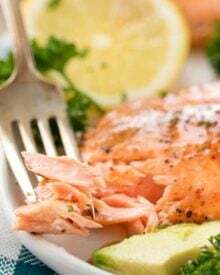 Salmon is one of those foods that can be eaten when it’s not fully cooked. After all, people eat raw salmon at sushi places! Most people prefer salmon to be cooked to at least medium rare. But how can you tell when it’s ready? To be precise, I highly recommend a digital food thermometer. I’ll link to one I love at the end of the post. In general, cook according to the guidelines listed above, insert a fork and gently twist. If it flakes nicely, it’s done. Easy peasy! I much prefer broiling, as the natural oiliness of the salmon is conducive to the high heat of the broiler, plus you get a great glaze or crust! 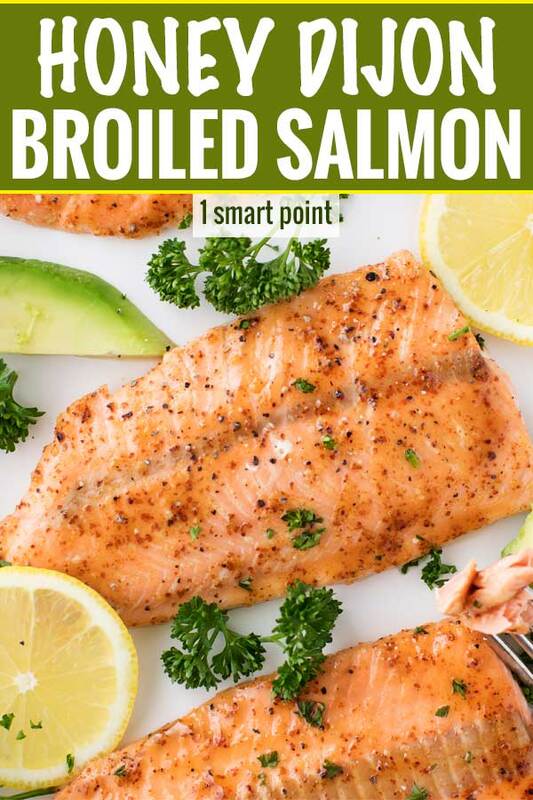 When you’re searching for a fantastically easy low-point meal, I hope you give this Honey Dijon Broiled Salmon a try! At just 1 freestyle smart point, you can enjoy nearly as much as you want! Instant Read Thermometer – never guess when your meat is finished cooking! Pastry brush – I like using a silicone brush, since you don’t have to worry about bristles coming off and getting in your food. 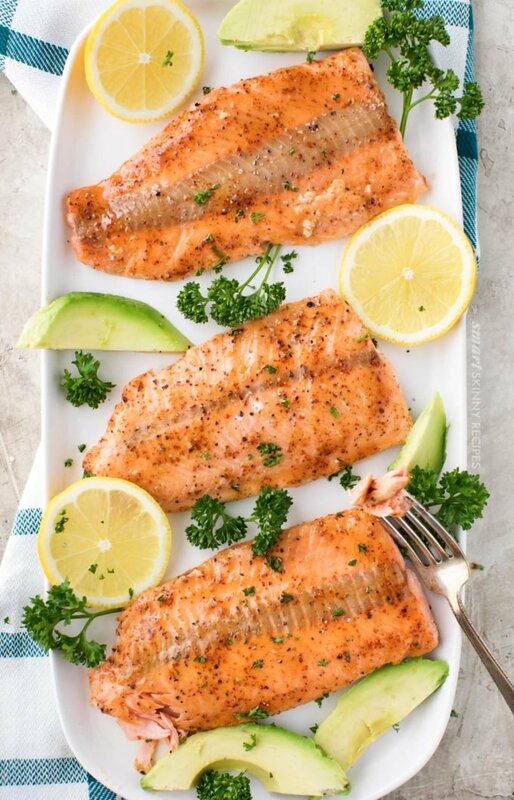 You'll love how easy this honey dijon broiled salmon is to make... just 10 minutes from start to finish! Adjust oven rack to be 6 inches from the broiler. Preheat broiler to high and line a baking sheet with foil or parchment paper. Pat salmon filets dry with a paper towel. Combine mustard, vinegar, honey, chili powder, salt, pepper and cayenne in a small bowl. 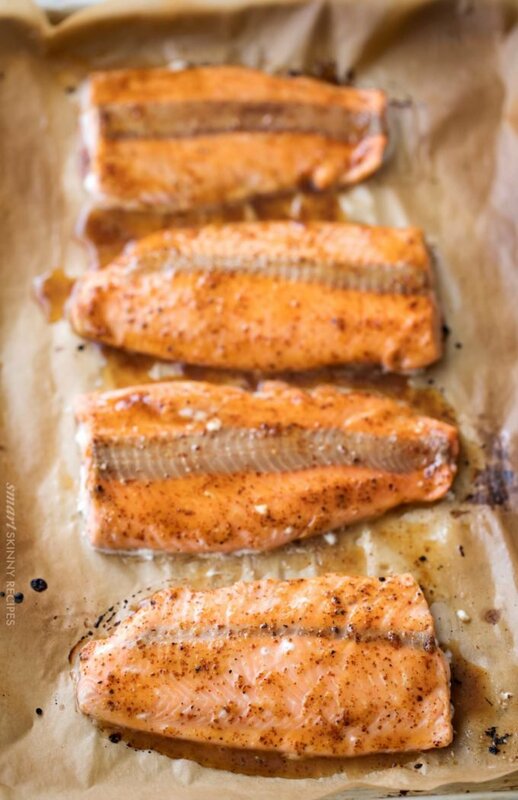 Brush over tops of salmon filets. Broil 8-10 minutes, depending on the thickness of the filets. My filets were on the thinner side, so they only took 8 minutes. I made this recipe just now for luncheon for a friend of mine…the mild marinade when I tasted it before I put it on the salmon left me wondering, but was I wonderfully surprised…absolutely DELISH. My only issue was that you had indicated in the recipe to put the fish on parchment paper under the broiler, which I did…HOWEVER, now Bosch oven, caught the paper on fire soooo, I managed to immediately pull it out and transfer the fish to tinfoil…much safer option for me…lol…otherwise, this will be a go-to. Thank you! And double thank you for calculating the points – Just joined Weight Watchers. I love trying a new salmon recipe! this one looks great! Now that is one super simple and healthy dinner idea! I may need to make this tomorrow! Delicious! 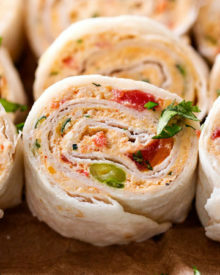 I’ve been meaning to incorporate more seafood dishes into my life, so this will be a must-make for me! Salmon is one of my favorite dishes, especially in the summer. This looks luscious and cant’ wait to give it a go! I have recently fell in love with making salmon at home. I will have to try this one out!